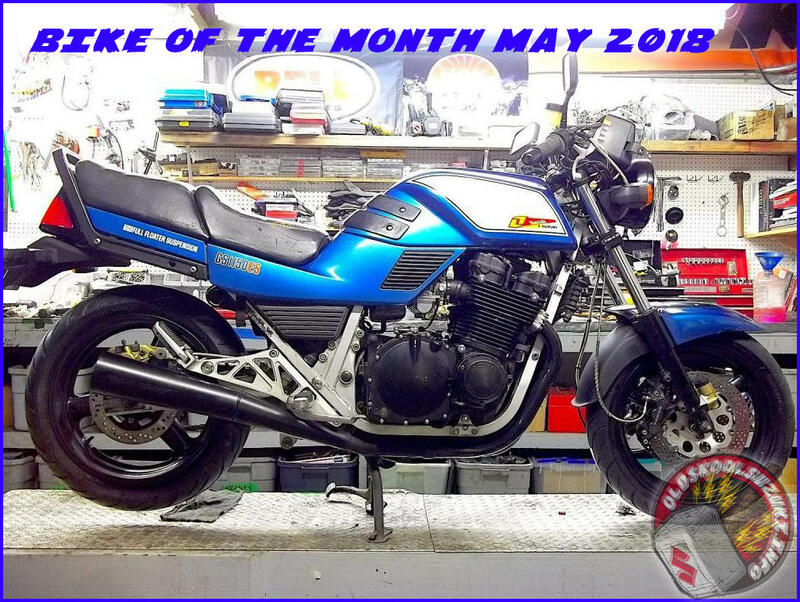 This month’s bike of the month is a tale of both resurrection and evolution. 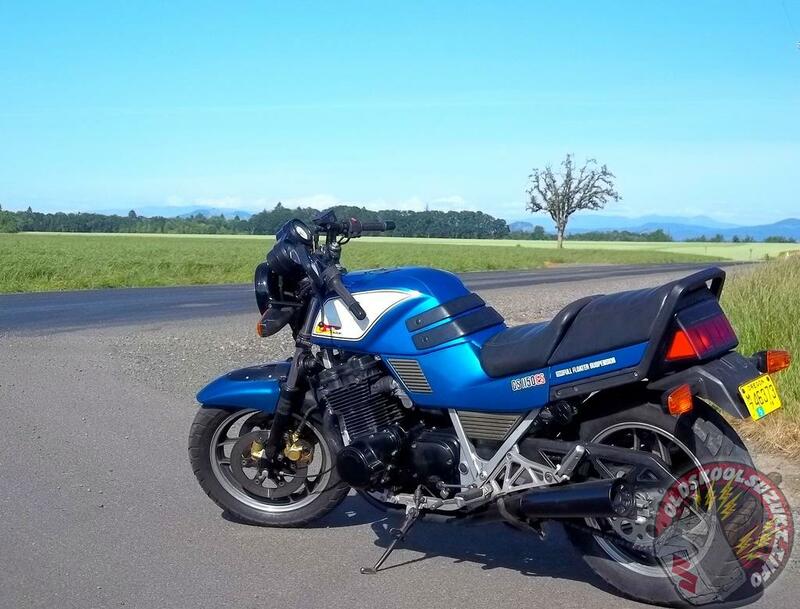 Plucked from an insurance sale, this slightly fire damaged, pretty standard machine was rescued by nightrider. It was quite a rare find – especially the other side of the Atlantic. The decision is what we at OSS would call ‘a no brainer’. 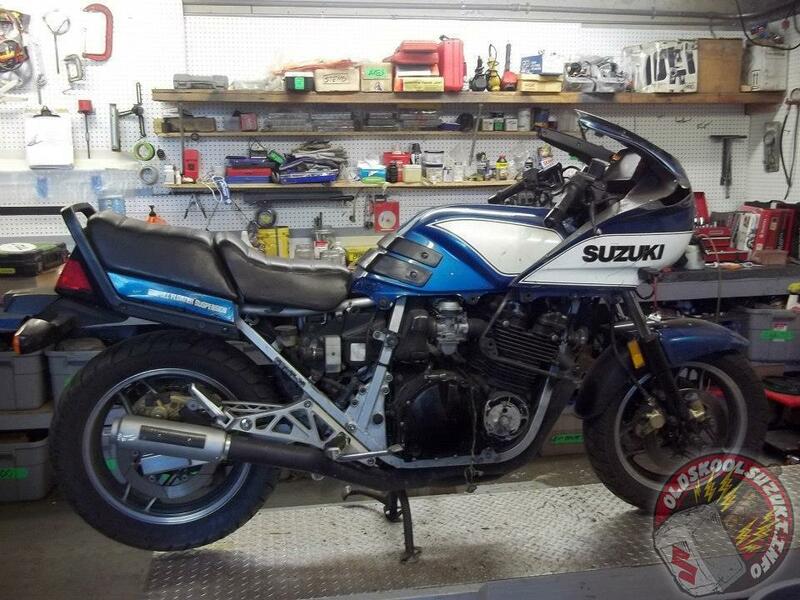 We’ve been watching the story of this machine since the oldskoolsuzuki.info site itself was resurrected and as is often the case with projects progress sometimes stalls. Over the last 3 years we’ve seen a pragmatic mix of make do (when the OEM spares are hard to get) and mend. With some advice and moral support from folk who have done the same thing as you and the balls to give it a go (or know when to sub it out) most obstacles can be over come. The proof is in the riding but this ES is easy on the eye in that striking blue squareness it wears so well. So the GS 1100 ES has now returned to it’s rightful duty as a smile inducing muncher of miles. And I have no doubt the story and evolution will continue. It’s a great bike. Who wouldn’t want it in their fleet? Long term member from across the water, nightrider had a touch at a salvage auction with a Suzuki GS1100ES bearing some cosmetic damage. Nothing that can’t be fixed, right? Right! Here, he takes us through his tried and tested approach to plastic repairs. I have been plastic welding for almost three decades now. I started in an old skool moto shop back in the 90’s. The old timers back then hated sportbikes so it was up to the young buck (me) to figure out how to fix those annoying fairings with that smelly Mac tools Plasti-welder. 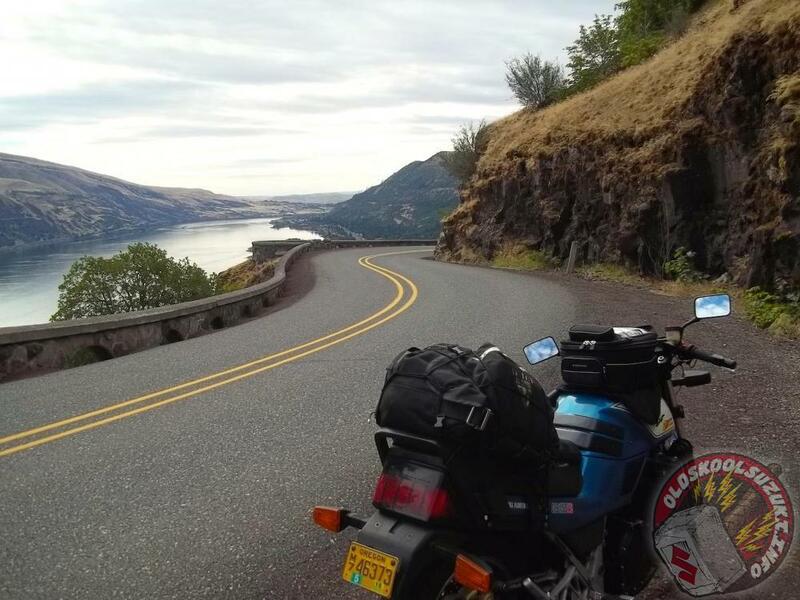 Through trial and error I weeded out what worked best for thin motorcycle plastics. Later I went on to repair Kayaks where the repairs were a bit more critical. That being said, plastic welding is a fairly easy process. 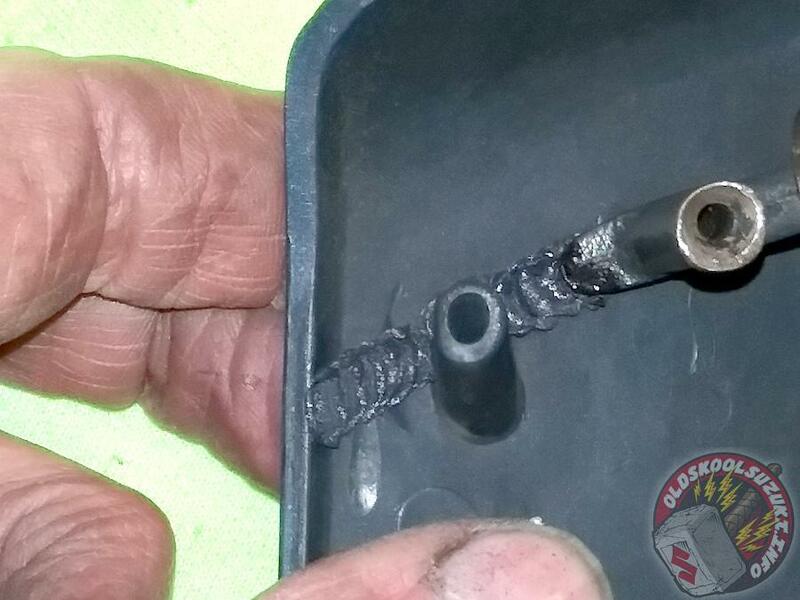 Most mistakes I see is from people just smearing the filler rod material on the crack like glue. It’s best to think of it as welding. 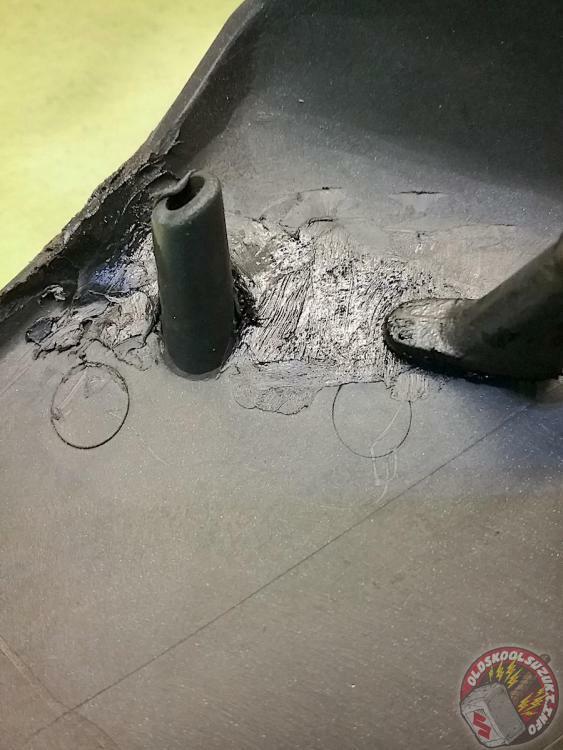 You have to get the filler material to penetrate and mix with the plastic being repaired. If you think of it more like really slow oxy acetylene welding you will have more luck. First off, you are going to have to spend some money. Yes, you could modify a soldering iron. Perhaps braze a foot on it? 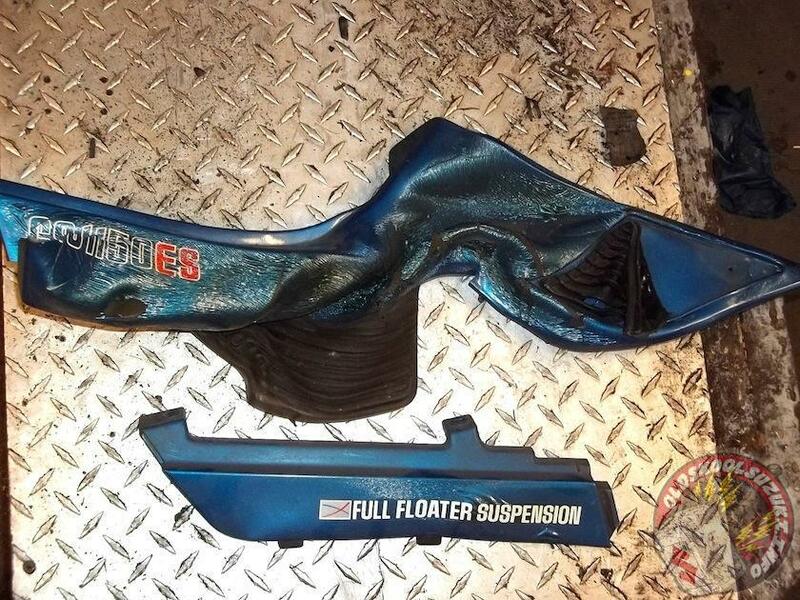 But if you purchase a Plasti-welder you will find it handy for fixing all sorts of things (like any other welder). 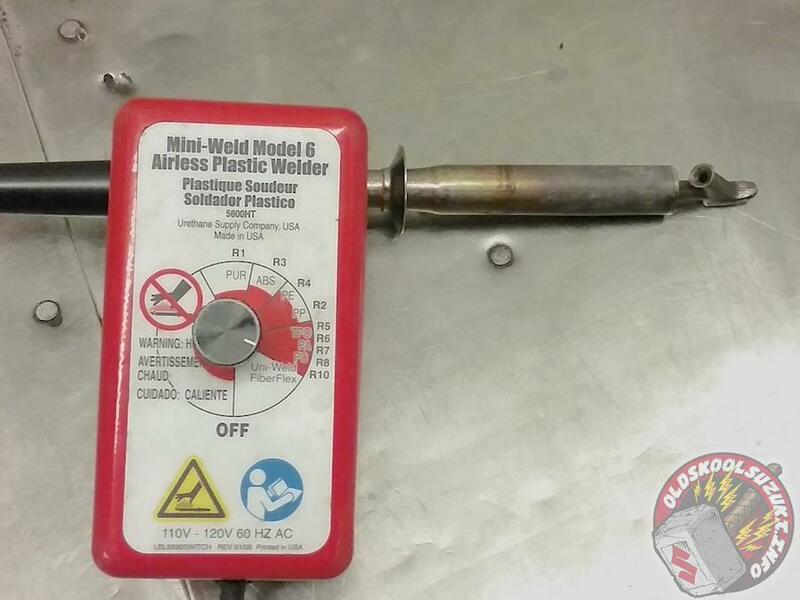 I’ve had the same Polyvance Mini-Weld Model 6 for over 10 years. There is a Model 7 now. They can be found on Fleabay or Amazon. Don’t bother with the flat welding material. 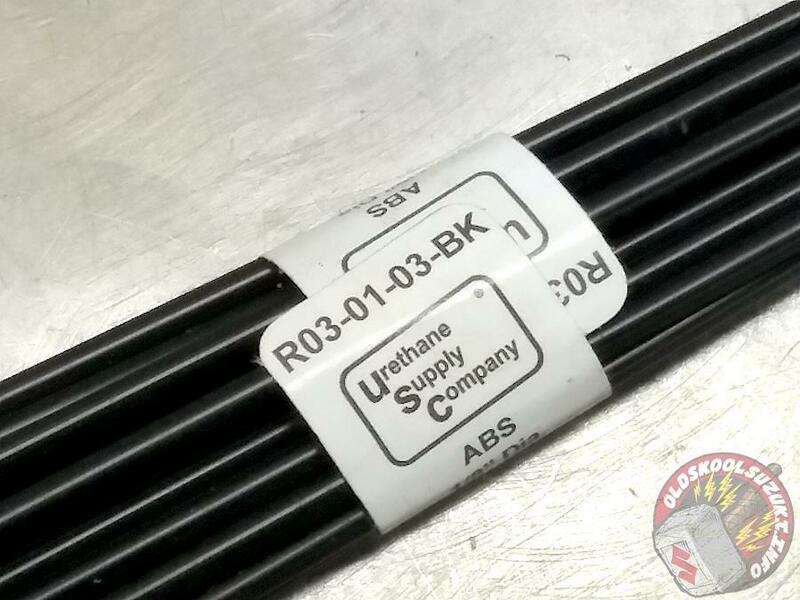 You will need the ABS R3 filler rod. Once you have your Mini-Welder and R3 rods you’re ready to go. Generally speaking you will only need to weld on one side. 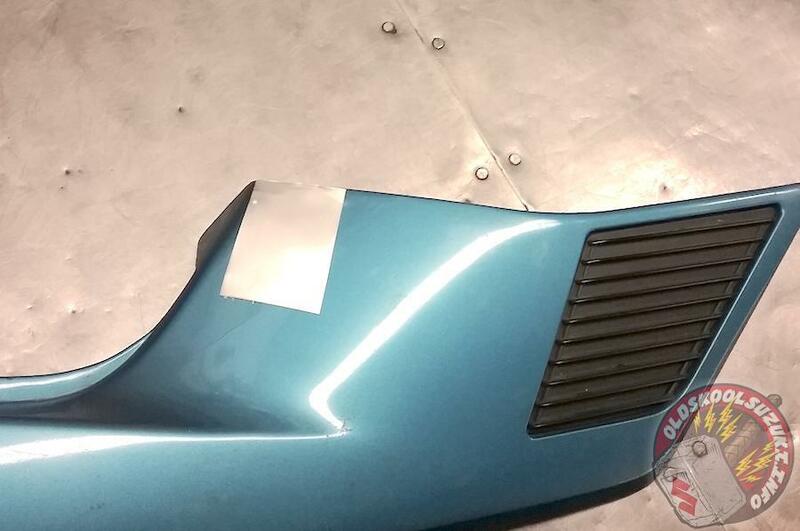 If your bodywork still has good paint you will want to weld on the inside (I typically always weld on the hidden side of the bodywork). First off I place a piece of foil tape on the outside as a heat sink (this helps to keep the crack from puckering with the heat). Next you will want to crank up the heat on your welder. 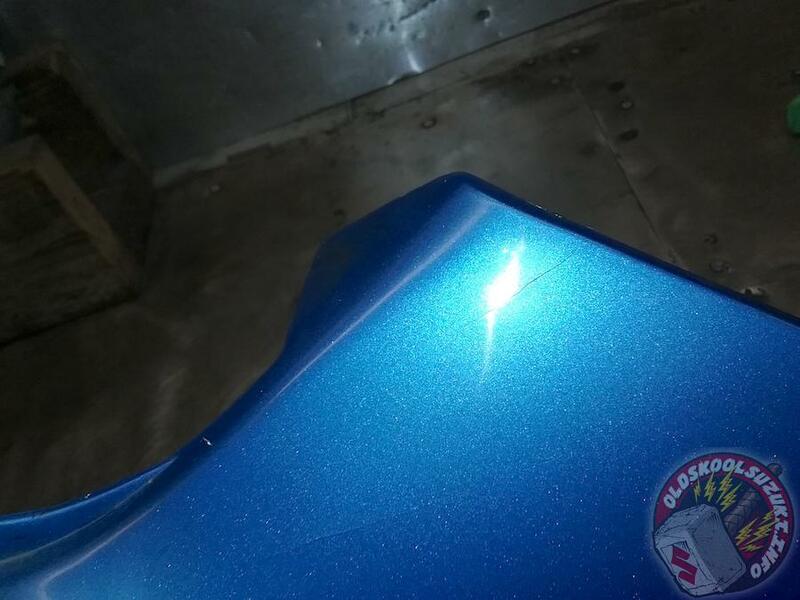 With ABS material I tend to just crank it all the way up to 11 but you might want to stick to the R3 setting if you’re dealing with y2000+ bike fairings as modern fairings tend to be pretty thin. Once it’s heated up you will want to “stitch” the crack. 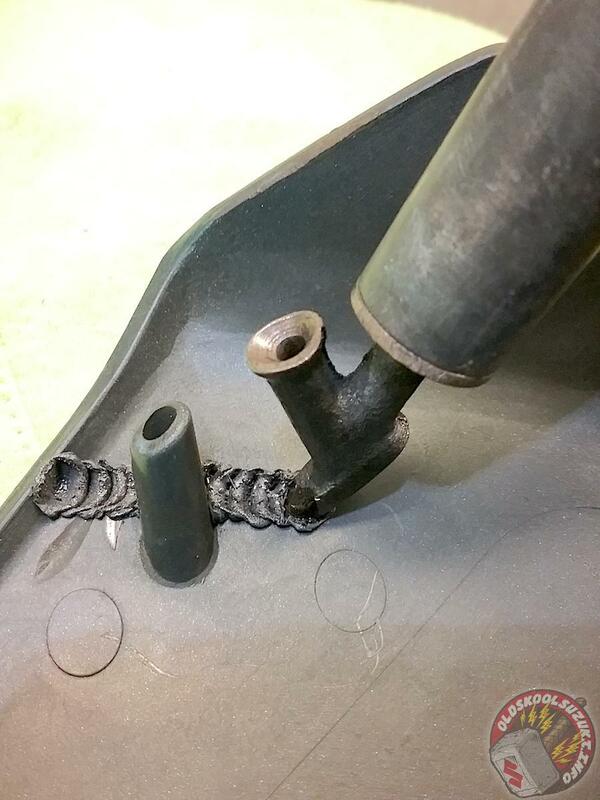 This both tacks your weld and makes it easier to mix the filler rod with the fairing plastic in the next step. Put your finger under the area you are welding and drive the toe of the welding iron into the plastic. You’re going to want to drive about 3/4 the way through the material you are welding at a fairly steep angle. With your finger on the other side you can feel how hot the plastic is getting. Too hot for you, too hot for the plastic. After you have done that you are ready to start filling. Stick the rod through the cylinder on the welder. With a wiggling motion, draw the welder across the stitch line while pushing the melting rod material into the little pockets in your stitches. Try to blend the two materials together (wiggling motion). 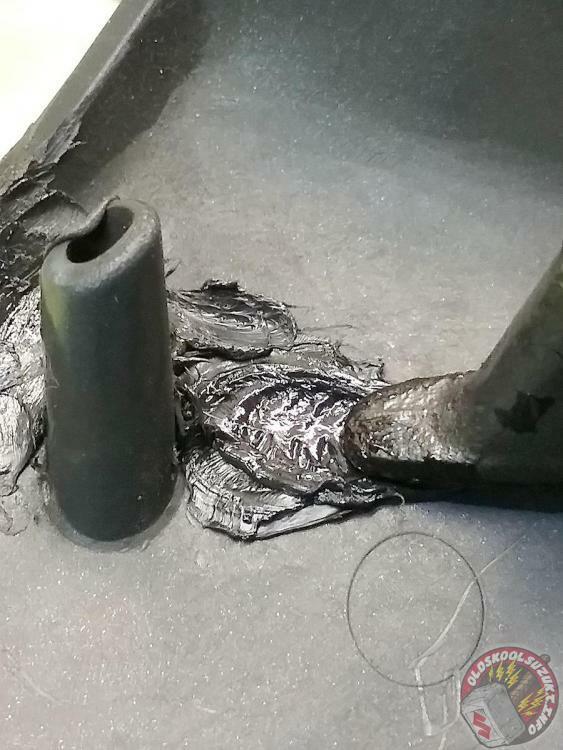 After that go back over your weld using the foot of the welder and melt down the excess and blend it into the surface. (This ensures that the outer edges of the weld are bonded and it makes it look a lot better). Take care to not get it too hot or you will ruin the paint job on the other side. Peel off tape and Bobs your uncle. With any luck you will barely even see the crack!